published January 6, 2019 is a PDF file. Two important closings have begun that will last for about a year. PATH will not run to World Trade Center on weekends, to allow for repairs to the Hudson tunnels. The deep station at 168th Street (1 train) will be completely closed while the elevators are removed and redesigned. 168th Street is an important transfer station and serves a large number of passengers for the New York Presbyterian Hospital and Columbia University's medical schools. On the other hand, it suddenly looks as if the complete closing for a year and a half of the 14th Street line (L train) from Eighth Ave to Bedford Ave, planned to start in April, will not happen— more to come. 5.31. January 2019. PATH between Exchange Place and World Trade Center is closed on weekends until 2020. 168th Street (1 train) is completely closed until 2020. 5.30. November 2018. I added the free transfer at the Church St Cortlandt St station, which opened earlier in 2018. 5.29. September 2018. WTC Cortlandt is open on the site of the old Cortlandt Street station that was destroyed in 2001. 5.28. May 2018. I'm late to the party on the Myrtle Ave reconstruction being completed, but here it is, the M train back to normal. The big change here is removing the ferry lines, because the number of routes in the East River now exceeds what I can illustrate without major revisions to the diagram. This is a railways diagram. I am still showing all the ferry landings, and maybe next time I will think of a brilliant way to show where the ferries go without drawing a large number of lines in the water. 5.27. Sep 2017. Part of the Myrtle is back— an isolated section in Glendale. The rest of the job now runs to next spring. 5.26. Jul 2017. Show the Myrtle Ave El as under construction. They are replacing the connecting ramp off the Broadway El and maybe taking the opportunity to do other work. This line will be more heavily used when the L line is shut down for tunnel reconstruction. 5.25. Jun 2017. Added the South Brooklyn and Rockaway ferries. 5.24. Jan 2017. Arthur Kill station is open! And I removed the symbol for subway lines under construction, since there aren't any. 5.23. Jan 2017. PATH is back full-time to 33rd St (mid December actually) and— wonders never cease!— after 44 years of hard work a segment of the Second Ave Subway is open! Over in Staten Island the Arthur Kill station, two side platforms on flat open ground, has been postponed again, so I'm optimistically calling it open 2017. I made a distinction in ferry services between 7 days and 5 days, so it is easier to tell what you can ride on your day off. 5.22. Aug 2016. PATH to 33rd St closed most weekends until December. Also: The J line has run to Broad St fulltime for a year now. I missed it. 5.21. May 2016. Wesmont station on New Jersey Transit. 5.20. Sep 2015. New subway line! One mile to one new station, 34th St Hudson Yards! How was this marvel accomplished! 5.19. Dec 2014. PATH to World Trade is full-time again. 5.18. Sep 2014. The Montague St tunnel (R) is open again. 5.17. Aug 2014. The 7 train extension is delayed again, to 2015. Fulltime M train as far as Essex St.
5.16. Mar 2014. Sandy again. PATH to WTC closed every weekend. 5.15. Aug 2013. Sandy strikes again. The Montague St Tunnel (R train) will be closed for over a year, for repairs. The Crosstown line (G train) will have some weekend closings caused by Sandy until December, but I don't revise for relatively short term changes, so that's not shown. 5.16. Mar 2014. Sandy once more. The PATH tubes to World Trade will be closed every weekend for repairs, so that section is shown as part-time. The date on LIRR to Grand Central is delayed again, either to 2021 (MTA estimate) or 2023 (federal estimate). Construction of this 3.5 mile route with one very large station began in 1969. Older update notes are here. Dig the old-school HTML coding. If you want to get an idea of the process involved in making this diagram and the obsessions of an amateur graphic designer, think hard about it, and then if you are sure, check my blog for posts named Making a Subway Map starting here in June 2010. Among other things I wrote about the issue of how much service detail to show on the overall system map. I don't want to repeat all that here, but I'm still thinking about it. That's why the subway letters and numbers showed up in 5.02, and went away in 5.03. For that matter I had never shown the names of the mainline railroad routes. In 5.06 I have again shown the subway letters and numbers, and added also the names of mainline railroad routes. 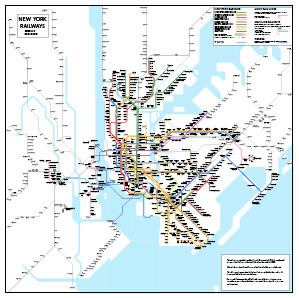 A portion of the old Subway Diagram features in Mark Ovenden’s book Transit Maps of the World, published by Penguin, October 30, 2007. If you are here looking at my diagram, you’ll probably want to be looking at his book too. The new 2015 edition no longer includes my map, but it's still pretty good. I created pages about Abandoned Stations back in 2001. They’re getting pretty crusty by now but you still might like them.